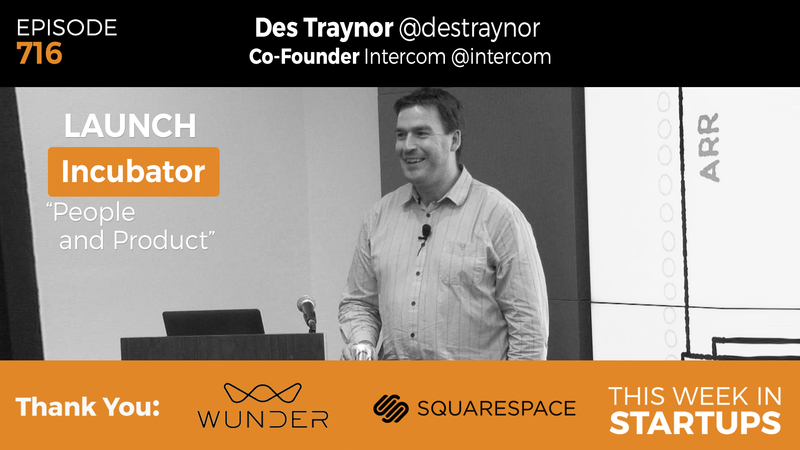 Intercom co-founder Des Traynor returns to the LAUNCH Incubator with another powerhouse talk. There are 3 ingredients to a company: people, product and profit. Today, Des focuses on people and product by extracting key principles from his experience at Intercom. He explains the importance of alignment and how it touches every aspect of running a company – from how a company behaves, to the hiring process, to how you speak to customers. Then, he shares 6 principles on building a product first company. Des wraps up his talk by answering questions from the class about lessons learned from Intercom’s early days, net negative churn, and ways to avoid the massive churn problem. 06:54: What makes a value? 13:09: Be careful what you ‘scale’. All behavior scales: good, bad, ugly. 40:37: Q&A – What is the number one thing you would change about what you did in the growth of Intercom? 47:24: Churn – top chart vs. bottom chart? 51:00: What does net negative churn mean? What are ways to avoid this massive churn problem?